OK so it’s Saturday morning!!! The most anticipated day of the week. For some it’s a day for chores, for others it’s a day to finally sleep in. Regardless of the situation, God is waiting patiently to commune with His beloved child – you. You may have a favorite spot in the house. Or, if you’re from a big family, you may very well have to find a spot, away from the buzz and the tempo. It’s always great when you wake up and it seems that everything is figured out. It’s so easy to get your morning prayer going. You can fling your hands in the air and just give thanks for all that your God has done, but what about the days that it just isn’t so easy? What about the mornings you wake up and the bills still aren’t paid? Or the morning you wake up to realize your spouse spent the night elsewhere? What about the mornings you wake up only to remember the fight you had night before with your teenager? It’s not so easy to lift Holy hands before the Lord and give thanks. You may even ask yourself “what am I to be thankful about?” But amidst all the drama there is ALWAYS a reason to give thanks. What about giving thanks amidst the trial? I know it’s easy to give thanks for the blessings we receive. It’s even doable to give thanks for the breakthroughs that quell the storms we face in life. But what about giving thanks amidst the trial? In the middle of all the hurt and pain and suffering? Seems impossible right?!?! But Apostle Paul did!!! While he was imprisoned He gave thanks to God. Not only did he give thanks to God but Paul was rejoicing FOR the chains. Apostle Paul was addressing the church at Philippi while being imprisoned for preaching the gospel of Christ. We too should proclaim the good news even as we face our own trials. While there Paul spoke openly to the church, sharing his wisdom with understanding concerning his dilemma. No idea where to start this morning? Paul rejoiced in his chains because he knew that it would bring glory to God and that it would lead to his eventual deliverance. He didn’t wait to praise God AFTER he was delivered. He made a choice to do so, WHILE in chains. It may seem as though the road you’ve been travelling down can’t get any worse. But, trust that through God it would surely get better. David, a man after God’s heart, found himself in similar situations. He also made sure to encourage himself in the Lord (1 Samuel 30:6). Heavenly Father, I thank you for this day. I declare that this is the day that you have made, I will rejoice and be glad in it. Lord Jesus, you are my Prince of Peace. Thank You for calming the raging storm in my soul when You took up residency within my heart, as You removed my sins and replaced them with Your righteousness. Thank you that you have bequeathed your peace to me, not as the world gives, so that my heart won’t be troubled or afraid while the torrential waves of my personal difficulties attempt to shatter my sound state of mind. Philippians 4:6-7Do not be anxious about anything, but in every situation, by prayer and petition, with thanksgiving, present your requests to God. And the peace of God, which transcends all understanding, will guard your hearts and your minds in Christ Jesus. 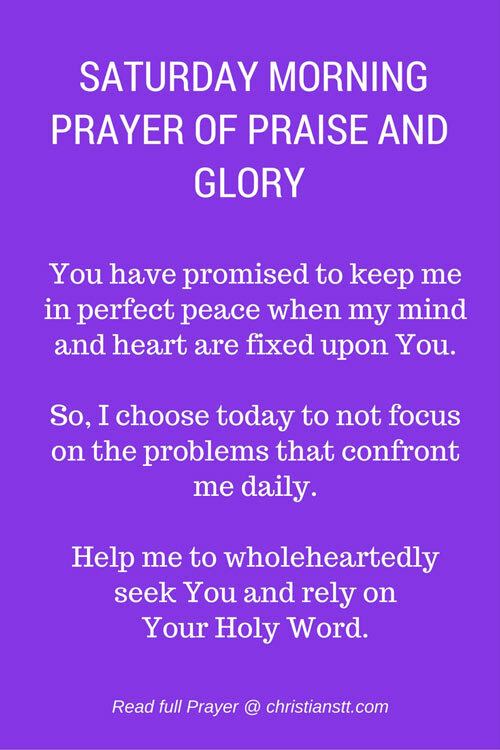 You have promised to keep me in perfect peace when my mind and heart are fixed upon You. So, I choose today to not focus on the problems that confront me daily. Help me to wholeheartedly seek You and rely on Your Holy Word, so that I will fully trust You to work out the problems that greatly concern me and not take matters into my own hands. You have overcome the world and You will also help me to overcome my troubles. It is in our weaknesses that Your power is made most visible in our lives. Because of the blood of Christ, I can overcome the opposition of the enemy and triumph in faith to the glory of God the Father. We pray this in Jesus’ name, Amen.